Goodyear is one of the world’s largest tyre companies. It employs approximately 69,000 people and manufactures it‘s products in 52 facilities in 22 countries around the world. Its two Innovation Centres in Akron, Ohio and Colmar-Berg, Luxembourg strive to develop state-of-the-art products and services that set the technology and performance standard for the industry. Established in 1898, Goodyear’s innovations have set automotive standards for more than 100 years. Goodyear EfficientGrip - This style of tyre is designed for passenger cars. Aimed specifically at economical driving, this tyre is a long-lasting, environmentally friendly and energy-saving option for every day driving. The lightweight structure and advanced tread compound offers better, shorter braking distances and quicker responses on wet and dry roads. The block design helps reduce noise and as the EfficientGrip range requires less energy to make it roll, this guarantees a quiet, comfortable ride. Eagle F1 Asymmetric 3 - The Eagle F1 Asymmetric 3 is a strong yet lightweight performance tyre that delivers steering precision, tread durability and fuel efficiency. Enjoy better grip and shorter braking distances on both wet and dry roads thanks to the Grip Booster compound made with adhesive resin to increase stickiness with the surface. 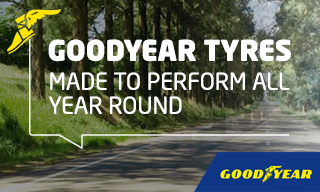 Goodyear Duragrip - Suitable for all types of family car and small city cars, this style of tyre has excellent cornering capabilities and responsive handling when you need it the most. Improved performance and stability on wet and dry surfaces comes as standard with this tyre, along with high aquaplaning resistance meaning that stopping and starting your vehicle happens with ease and water is quickly dispersed. The Duragrip range offers greater fuel efficiency and improved mileage, along with a quiet, comfortable ride.